Bangkok is one of the world’s largest and most attractive tourist destinations. 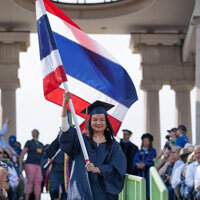 It is therefore no wonder that faculty and students in the Business Department of the Bangkok campus of Webster University Thailand focused some of their research on Tourism Science. Last summer, former MBA graduate student Rituraj Bhuyan presented his research on the influence of management practices on turnover in a five-star hotel at the prestigious 8th Advances in Hospitality and Tourism Marketing and Management (AHTMM) Conference held in Bangkok. This year sees yet another Webster student presenting. MBA graduate student Sirilak Khetsoongnoen was accepted to present her research at the 9th AHTMM Conference, held this summer in Portsmouth, England. Sirilak's survey of 300 foreign visitors to Bangkok provided the first decisive confirmation that the image of a tourist destination plays an important role in the satisfaction of its visitors. Other researchers had found indications of this unexpected effect but Sirilak could unequivocally establish this, contradicting standard theories about consumer satisfaction. Sirilak, a lecturer at universities in Bangkok for tourist guides, is one of only three licensed Thai tourist guides who is certified from World Federation of Tourist Guide Associations. Click here to learn more about Webster Thailand and past ATHMM Conference presenters.